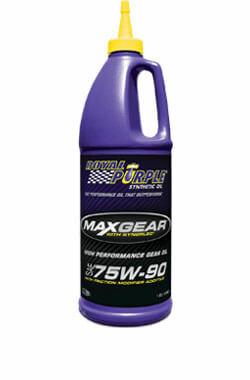 Recommended for use in truck and automotive front or rear differentials, manual transmissions, and lower-gear units of marine engines that use API GL-5 or GL-4 fluid, Max Gear high performance synthetic gear oil from Royal Purple is specially designed to extend gear and bearing life. It won’t corrode soft yellow metals, is synchronizer safe, and provides superior protection over competing conventional and synthetic gear oils. Max Gear fulfills this function while maximizing power throughout the drivetrain, making gears run smoother, quieter, cooler, and longer without overhaul. A direct benefit is an increase in fuel efficiency for trucks and other four-wheel-drive vehicles. With its integrated friction modifier additive, Max Gear requires no additives to function optimally. Royal Purple makes Max Gear in the following viscosities: 75W-90, 75W-140, 80W-90, 85W-140, and SAE 90. Maximizes horsepower and extends gear/bearing life. Reduces operating temperature and offers severe service performance. Lower coefficient of friction and superior corrosion protection. Formulated for limited-slip differential use. Separates rapidly from water and meets warranty requirements.